Ryan Giggs: Which stadium should he choose as Wales' home? 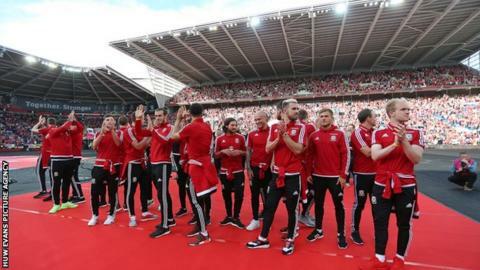 Cardiff City Stadium or Principality Stadium - where should Wales' football team play their home games? The decision is among the items in new Wales manager Ryan Giggs' inbox as a new era beckons for the national team. Football Association of Wales chief executive Jonathan Ford says Giggs will have their support in whatever he decides. The Cardiff City Stadium became Wales' regular home at the start of what became a historic qualification campaign for the 2016 European Championship. Then-manager Chris Coleman was reluctant to leave the venue which he made a fortress, having hosted famous nights such as the 1-0 win against Belgium and victory over Austria by the same score. However, the smaller capacity of the Cardiff City Stadium has seen many fans miss out on tickets for crucial games and seen the FAW miss cashing-in on Wales' recent success by using the Principality Stadium, which can hold twice the number of supporters. Coleman's successor, Giggs, played in the first Welsh international match to be staged at what was then called the Millennium Stadium in 2000 when a record 66,000 fans saw Wales slip to a 2-1 defeat, under Mark Hughes. The FAW continued to use the national stadium until March 2011 when Wales suffered a 2-0 defeat to England in front of 69,000 fans. What do the former players think? Danny Gabbidon won 49 caps for Wales during his playing career, a number of which came at Principality Stadium. The former defender believes going back to the national stadium is unrealistic. "It's disappointing because the Principality (Stadium) is our national stadium and it's iconic. It would be great to have the national team playing in there, but you have to be realistic," he said. "Would you fill that stadium game in, game out? I don't think we would. The pitch, as well, was a big bugbear of mine; I used to hate playing there. "The momentum is building and we want to keep that going, but to do that, it should be at the Cardiff City Stadium with the team doing what they are doing. "This is something we can look at again further down the line." "Maybe the FAW would be happier filling the Principality Stadium and getting more money to invest in the FAW," said Jones. "But at the moment the Cardiff City Stadium is the players' home and that's where they feel happier." Former Wales striker, Iwan Roberts, believes playing in front of a full house at Cardiff City Stadium every game is better than occasionally reaching higher attendances at the Welsh capital's showpiece venue. "They should stay where they have been the past few years. I wouldn't want to change a winning habit," he said. Asked whether it's better playing in front of 60,000+ fans instead, Roberts said: "It does make a massive difference, but I can count on one hand the number of games where that has happened. "It is a rugby stadium first and foremost, we've been there a few years, but I'd much rather be jam packed with loads of fans and a great atmosphere." Another former Wales midfielder Carl Fletcher said: "I'd like to see them play wherever they get the best results, really. "I'm sure Ryan will be looking at how he wants the team to play and he'll be looking at the surfaces of all the stadiums to see which best suits. "But going on the past few years, the Cardiff City Stadium has definitely been a benefit for Wales." Asked if going to Principality Stadium would show some ambition, Fletcher replied: "That's true. But I think the main thing is for the football. "It's great making a statement, going to a bigger stadium, but if it's not full every time we play, it takes away from that statement."